In the constant race to one-up the other memory vendors in the highly commoditized DRAM market, at Computex last week G.Skill demonstrated its Trident Z RGB memory modules running at rather unprecedented data transfer rates. While operating DDR4 at 5000 MT/s in dual-channel mode is not considered a breakthrough these days, running memory at 4000 MT/s on an AMD Ryzen system is something rather unique. One of the peculiarities that AMD’s first-gen Ryzen platform has is a memory sub-system that cannot handle data rates significantly higher than 3200 ~ 3466 MT/s. 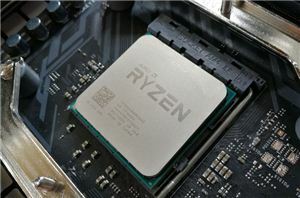 With the second-gen Ryzen platform AMD partially fixed the problem by altering the caching sub-system and upgrading firmware, yet without actually changing the memory controller. Therefore, running memory at high frequencies is still a challenge with the Ryzen 2000-series. 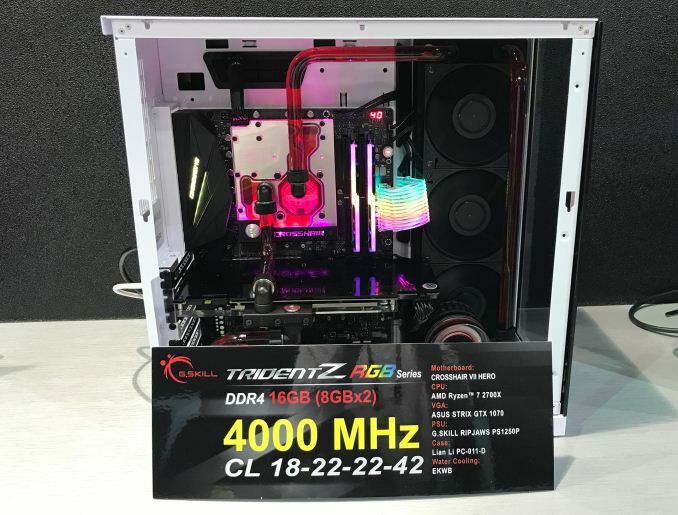 Nonetheless, as the things are getting better, companies like G.Skill can push DDR4 modules all the way to 4000 MT/s with CL18 22-22-42 timings on a Ryzen 7 2700X CPU, as well as with CL20 22-22-44 on a Ryzen 5 2600 processor. 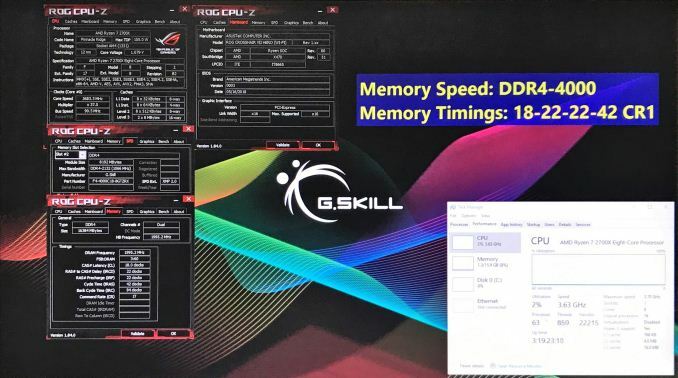 Obviously, DDR4 memory modules have to use 1.35 V at high speeds, but G.Skill has not specified voltage for the memory kits in question. Without any doubts, it has taken G.Skill quite some time to figure out precise sub-timings for a DDR4-4000 operation on a Ryzen 2000-series/X470 platform. 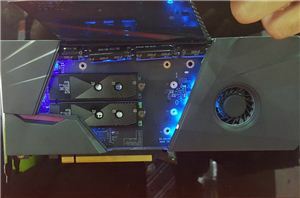 Moreover, the company is only demonstrating two dual-channel 16 GB kits, so some luck with the modules and the processors may be involved. Meanwhile, it is also worth mentioning that G.Skill supplies memory for AMD’s Ryzen review kits sent to journalists and other partners of AMD, so it gets to spend more time tweaking SPD settings for AMD Ryzen systems than any other supplier of memory modules. 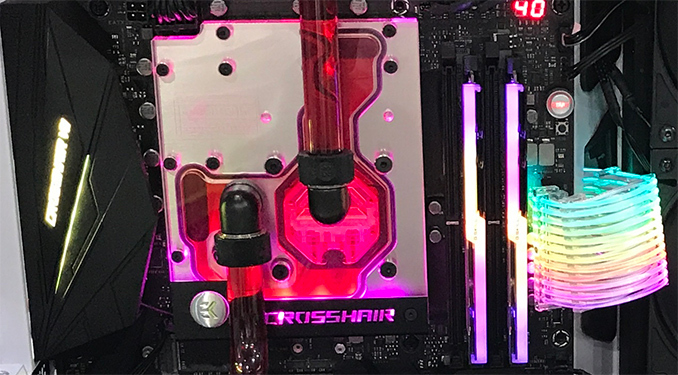 Intel’s memory controllers and memory sub-systems on the latest platforms have their perks, but G.Skill has a lot of experience with Intel’s CPUs in general. 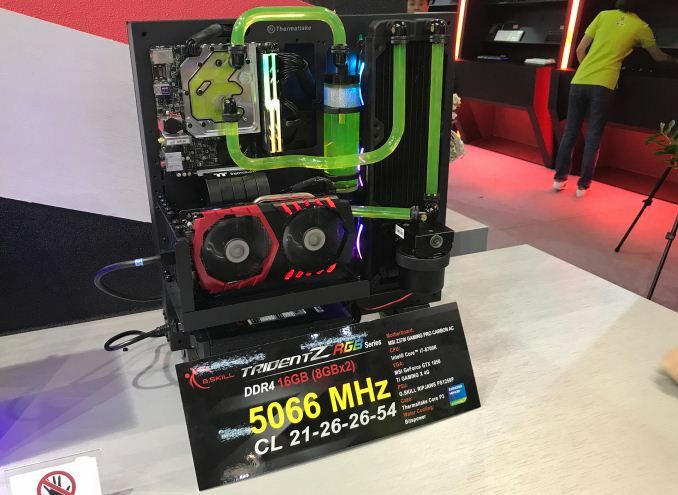 Therefore, it was not surprising to see that the company could hit DDR4-5066 with its latest Trident Z RGB memory modules albeit with very loose CL21 26-26-54 timings at a high voltage. 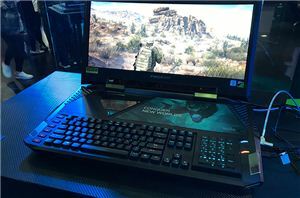 Obviously, Computex demonstrations do not necessarily indicate imminent product launches. Nonetheless, if G.Skill can hit certain data transfer rates with hand-picked DIMMs, it learns what is needed to replicate the same settings in mass products. The only question is when such products become available and at how high their prices are going to be. IMO is for the benchmark champions, not real world use, at least I cannot think of one, when the latency mucks up the bandwidth available it becomes not really worth it for much of anything else.